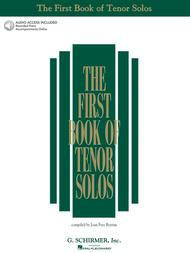 The First Book of Tenor Solos (Book/CDs) (Book/CD package (2 CDs)). For Piano, Vocal. Vocal Collection. Vocal Standards, Classical and Play Along. Difficulty: medium to medium-difficult. 2 accompaniment CDs and collection. Vocal melody, lyrics, piano accompaniment and introductory text. 128 pages. Published by G. Schirmer (HL.50483783).ISBN 063402048X. With vocal melody, lyrics, piano accompaniment and introductory text. Vocal Standards, Classical and Play Along. 9x12 inches.This is among the most widely used teaching repertoire for singers in the U.S. Over 30 songs in each book, including American and British art songs, folk song arrangements, sacred songs and a sampling of beginning songs in German, Italian, Spanish and French. There is a completely different song selection for each voice type.